Evidence of a vanished civilization has long been suspected to exist under the thick layer of earth laid down at the close of the last ice age. Known as the Bretz floods, numerous colossal tidal-waves of melted glaciers swept over Eastern Washington and down the Columbia River Gorge, ponding over the Portland area, and depositing silt, before flowing out to sea. Sand, gravel, and finally, clay covered all that had been created before 10,000 years ago, leaving no physical trace of existence for future generations of inhabitants. Psychic archeology, however, can sometimes probe to depths of hundreds of feet. Although not fully understood nor accepted by authorities, no one can argue with results. The Mystery Hole™ stands in mute yet undeniable testimony to the validity of following the mind’s eye with pick and shovel. No one would have suspected from looking at an ordinary wild blackberry patch in a suburban backyard, that Oregon’s most incredible archeological site lay waiting beneath. No one, that is, except those using their natural psychic abilities to “see” a Giant Double Arch™, a stupendous Gaping Tunnel™, and cryptic rock inscriptions appearing to be lazer-blasted in a strange stone-like material indistinguishable from our modern day concrete. What good is the Hole? No one can say with authority that breathing the peculiar, cool air which wafts up from the Mystery Hole can cure any and every illness you might have. Nor that you will suddenly have more money than you know what to do with. Nor that you will find true love in less than a month. However, there are those who feel that they have been helped in health, romance, and/or money by breathing the Enchanting Vapors of Encouragement™. Without being certain of who dug the Woodstock Mystery Hole, it is virtually impossible to determine how it was created. The absence of pick and shovel marks points to crude methods by a primitive people. However, this is given by some researchers as evidence of extraterrestrial activity. Indeed, marks not unlike laser-blasting are clearly visible on the walls of this gaping cavern, adding fuel to the fires of debate. Most experts and theorists do agree on one thing—it was not created by natural forces. The Mystery Hole goes all the way to the bottom. The depth of the Woodstock Mystery Hole has never been accurately determined by modern scientific methods, and estimates vary greatly, but the over-all consensus is that it is very deep. Perhaps the most puzzling mystery of all is the original purpose of the Hole. Theories have been hotly debated since the discovery of this enigmatic wonder by modern Man. Was it used as shelter? Was it a ceremonial kiva? Was it an outpost for beings from another planet? Did someone just dig a hole? Well, it seems that more questions than answers have been unearthed by the discovery of the Woodstock Mystery Hole. What do the authorities say? The scientific establishment remains remarkably silent in the Woodstock Mystery Hole controversy. Perhaps, as some insiders speculate, they still haven’t figured it out themselves. Until they do, the whole family can join in on the fun of theorizing and postulating. Safety and protection are major concerns at the Mystery Hole. Since it’s not safe, protection is needed. For this purpose, liability waivers are available for signatures before descending into the depths. I, the undersigned, do hereby certify that I must be out of my mind to climb down into a damp, dark hole when I’m perfectly safe where I am. Perfectly aligned with the North Star, a stupendous arch stands guard at the entrance to the phenomenal gaping tunnel at the bottom of the sensational Woodstock Mystery Hole. The ratio of the height to width is precisely 1.618—the same ratio found in natural spirals from sunflower heads, to snails’ shells, to spiral galaxies. This “Golden Mean” of geometry was not determined until the 13th century! How could a primitive people have known the solution to a problem that took mathematicians centuries to unravel? Perhaps the architects were not so primitive after all. Mysterious “carvings” on Giant Double Arch have endured the untold eons, but their meanings have been lost in the sands of time. Attempts to decode the ancient symbols have only added to the confusion. Is that really a flying craft with a pilot at the controls? Do those formula hint at a cure for cancer? Could the star pattern on the vault be a clue to the origin of mysterious visitors from space? How Old is the Arch? The novice archeologist might date the arch at less than 5,000 years, simply going by the thick over-layer of sediment from ancient floods. But, extraterrestrials who have mastered the art of laser blasting could put an arch anyplace they feel like. Perhaps the most incredible discovery of all: a massive, rough-hewn, but intricately carved, entrance to...? Could it be a subterranean city complex? At the far end of a side tunnel in the very depths of the Mystery Hole™ sits a portal created in a scale unmatched even by the Giant Double Arch™. The vast, as yet immovable door speaks of a people whose height is almost unimaginable to us. The subterranean complex hasn’t been found yet, but most researchers doubt that an entrance would have been created without something to enter. Only further excavations will unravel the Hole “truth”. A colossal windstorm of monumental proportions toppled the Mirror in 2008, shattering it into a million pieces—give or take a few hundred thousand pieces. A fragment still provides a glimpse into the infinite depths of darkness, and those who dare to stare into it may find themselves face-to-face with a darker side of their personas. It is believed that each of us has a dark side that we reveal to no one, not even ourselves. Shocking personal revelations await those with the courage to gaze deeply into an awe-inspiring, fragment of the megalithic slab. What will your reflection be in a piece of the entrancing “Black Obsidian” Mirror of a Higher Truth™? A pocket-sized relic of the shattered Mirror is available at a surprisingly low price in our ever-popular Gift Shoppe. A tragedy—the shattering of the “Black Obsidian”Mirror—can be turned into opportunity, which is what has replaced the Mirror. In this case, the window of opportunity is “silver” and offers two ways of looking at it. In the years following the unsolved mystery of its sudden horizontal realignment in 1988, the Mystery Tower has passed through many phases. At times it was 66.6% erect—at times only 33.3%. It stood at 100% for a time, inspiring all who bore witness to its height. Replacement of the giant “fluorite crystal,” shattered in the Realignment of ‘88, will be guided by cryptic inscriptions ensculptured on the Giant Double Arch™. What’s the Mystery Tower for? It may very well be years before its true purpose is determined. In the meantime, it serves as a holy beacon to Fun seekers, a rock gym, an axis mundi, and more. Until the transceiving fluorite crystal is ready, a sailing boat serves well as a substitute, rewarding climbers with mountain views and dreams of far-off worlds. It has been said that a force powerful enough to charge the entire planet with positive energy could be generated from a tower such as the one depicted on the Arch. Visitors are encouraged to take pictures of the Suggested Photo Spot: designated by the Center for Land Use Interpretation, and highlighted by an exciting, pointed electrical display. 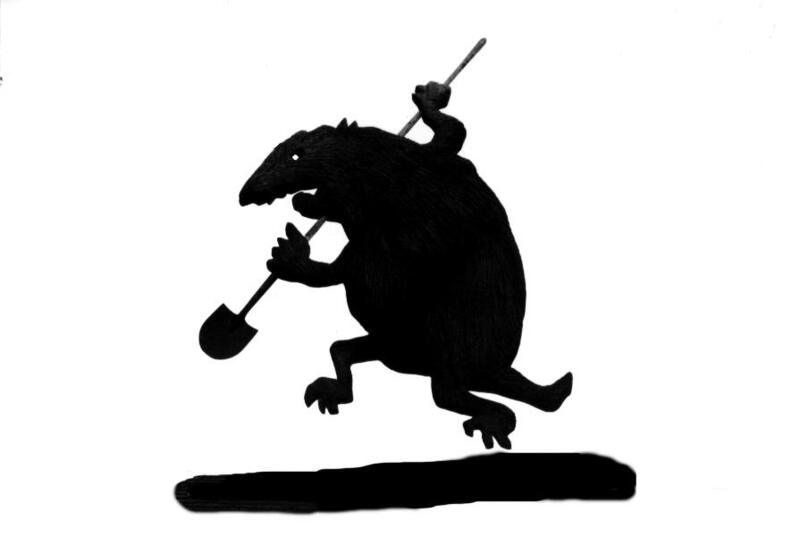 Affectionately called Molokai by some admirers, the gargantuan History Mole embodies the spirit of obsessed diggers the world around: advancing with shovel poised and a gleam in the eye. Being photographed with Molokai is said to bring good fortune for diggers, and to ward off caving, running ground, and bad air. All who have wishes are encouraged to drop a coin in the Wishing Pipe. Visitors are astounded to learn that every wish is 100% unconditionally guaranteed for life. Black as the Hole itself, visitors defy gravity by gripping the Mystery Pole with gloved hands while descending from the Mystery Hedge Walk. 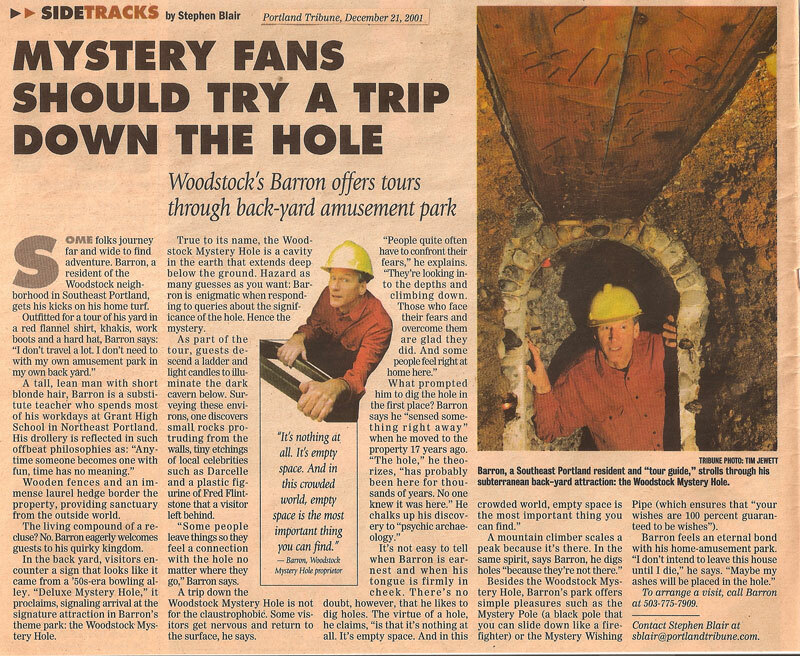 In addition to being listed in many guides of what to see and do in the Pacific Northwest, the increasingly-popular void known as the Woodstock Mystery Hole has received more than its share of in-depth media attention. Anodyne, a Portland arts and culture magazine, dedicated more than two literary pages, with Mr. E. Mann emerging from the Mystery Hole on their cover for September 1997. Anodyne is no longer published. Atlas Obscura has provided potential visitors with a glimpse of the Hole for several years. 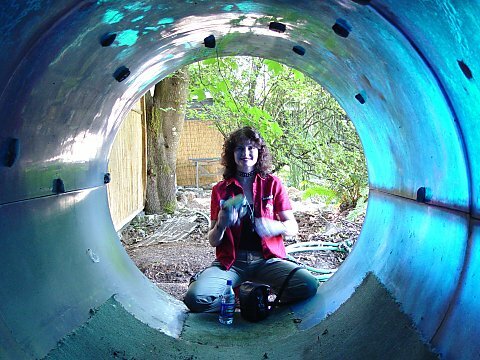 (video) KATU TV in Portland Oregon, as part of their “What’s Weird About Portland” series, gave viewers a quick view of the Hole on November 9, 2007. (Video may not be available). KGW TV’s locally-produced program, Good Evening, featured a tour of the Hole with Mary Alice Rosko, giving viewers a rare glimpse of the Giant Double Arch, Mystery Tower, and Stupefying Double-wide Stairway to Upthere. The program has since gone off the air. Lex Loeb’s UFO Museum offers an online tour which may be quite dark on most monitors, enhancing authenticity. 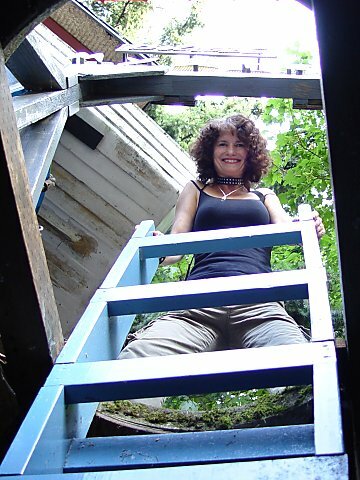 On The Mercury’s Blogtown, Sarah Mirk related her experience at a Meteor Shower hosted by the Mystery Hole in August 2010. Monk magazine’s Portland issue, which finally hit the newsstands in late 1994, included a lengthy, somewhat fictionalized, exploration of the Hole. Monk Magazine is no longer published. Monk Travel lists recommended places in Portland which they have visited and enjoyed. Scroll on down to find the Hole. The Nose, a now-defunct magazine out of San Francisco, published an article attempting to explain some of the Hole mysteries in their July/August 1994 issue. 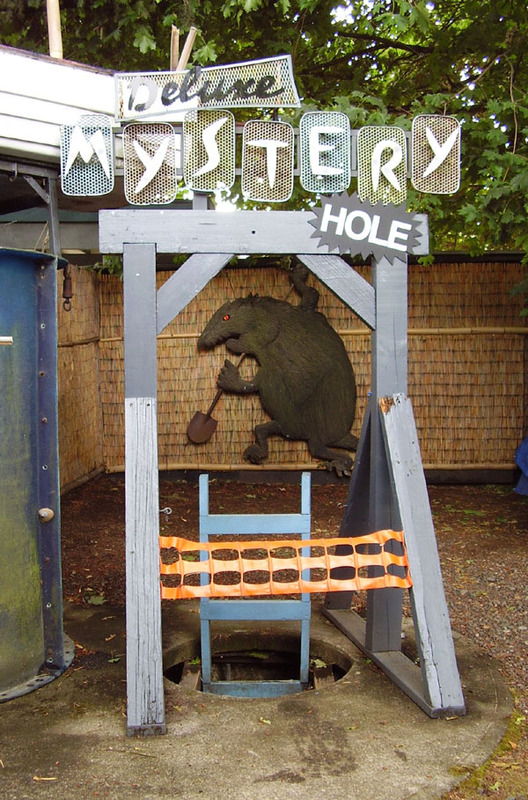 Portland’s Oregonian newspaper included a large color photo of the entrance to the Mystery Hole™ in August 1992. Portland Monthly Magazine covered the annual Meteor Shower party at the Hole in August 2014. The Portland Tribune’s premier issue of Cue magazine prominently featured the Hole on December 21, 2001. Cue magazine is no longer published. Strange Universe aired a sensationalized tour of the Mystery Hole at least three times before strangely going off the air—or have they? (video) Waffle Machine condensed a full tour into a 4 minute video. Weird Mysteries site circles back around to Lex Loeb’s UFO Museum, but on the way you’ll see new photos. (video) Weird America toured the Hole in August 2003, and compiled a video. Puzzling Evidence TV has released archived video of the Church of the SubGenius world tour’s March 14th 1998 visit to the Mystery Hole™. The last five minutes of the video below documents preparations for an old-fashioned, slack-filled SubGenius Devival in Portland, which prepared the faithful for X Day—mere months away. For a month, Widmer Brothers Brewing promoted the Mystery Hole in radio spots all over Portland for their “Nothing filtered out” ad campaign. Radio provides the perfect medium for visualizing void art works such as the Hole. Wild Life: Unusual Oregon by Mark Christensen includes a large photo of Mr. E. Mann beside the Hole, and an enticingly accurate description of it. (Sasquatch Books 1997). Awareness of the Mystery Hole continues to spread by word of mouth from person to person through the grassroots grapevine of the people. An excerpt from My Summer in a Garden. Sorry, tours in person are no longer available. What is a Void Art installation?